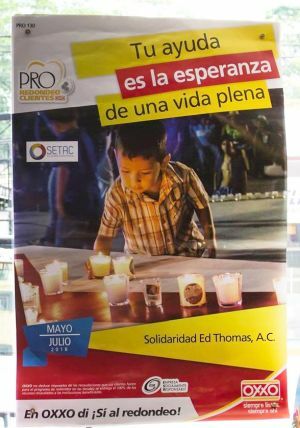 Puerto Vallarta, Mexico - Since its inception in 2002, OXXO's Redondeo program (round up at checkout) has supported over 1,800 non-profit organizations throughout Mexico with over $750 million Pesos delivered to them. SETAC, Puerto Vallarta's LGBTQ Community Center, will be the beneficiary organization from May to July, 2018. The funds will be used to further fulfill SETAC's mission of eradicating HIV and other STDs among the LGBTQ community in the greater Banderas Bay area through education, detection and prevention. "The financial contributions we receive from members of our community are essential to be able to fulfill our mission," said SETAC Director, Paco Arjona. Free testing, counseling, medical referrals and education for HIV and other sexual transmitted illness are just some of the services provided by Vallarta's SETAC Community Center. The Center also offers several programs that are meant to improve the entire community's physical, emotional and spiritual well being, including: the distribution of condoms in local bars; providing milk substitutes for babies born to mothers living with HIV; English classes, film screenings, discussion groups, and other activities - all free and available to the general public. If you wish to support SETAC, and the essential services they provide to the community, please be sure to answer "Sí!" when the cashier at your neighborhood OXXO store asks you if you wish to round up your change.